Rebecca (@recgator) is Not Nosy…just curious! Each episode she indulges her curiosity through casual conversations with artists she knows and admires in a long-form interview that can go in just about any direction. Marelou Janzen (mejanzen) is a Graphic Designer and Animator based out of Alberta, Canada. Rebecca highlights some of her favorite animated shorts made by Marelou, and the two discuss art, design and animation -- and the often difficult path of following your dreams. Marelou and Rebecca also talk about the adventures of living abroad, her Filipino heritage, food and karaoke. One of the recurring themes of the conversation is motherhood. 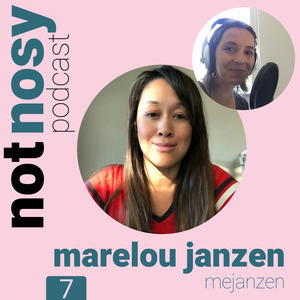 Marelou and Rebecca discuss the challenges of keeping up with your career as a stay-at-home-mom, the importance of "mom friends", and how creating art can both keep your skills sharp while also being therapeutic. Marelou also contributed several character designs to the USAi complete series and the Come Sing with Us YouTube channel. Follow @mejanzen on Instagram, Twitter, and HitRecord. Not Nosy Podcast is supported by the Knowing: Short Film Kickstarter campaign. Check out their project video and help them get funded by May 17, 2019. Visit KnowingShortFilm.com. 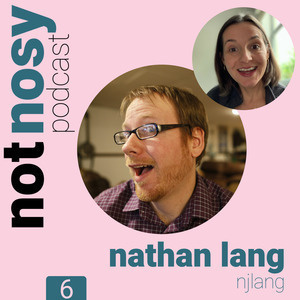 Nathan Lang (njlang) is a musician, singer/songwriter, web developer, and more based out of Kansas City. Nathan and Rebecca talk about music, photography, and really dig into some cool stuff that he's doing with HitRecord. Nathan talks about his process of creating music, and we listen to a couple of samples of his work with other artists. Nathan is really a collaborator extraordinaire, with such a variety of skills that you may see him create lyrics for an instrumental (or an instrumental for lyrics), edit a video in a way that would have never occurred to anyone else, or analyze data and publish the results with his own analysis. A jack-of-all-trades that loves to collaborate with others -- you won't want to miss this episode with Nathan Lang! Inês Reis (Ines_Reis) is a writer of scripts and screenplays based in Portugal. 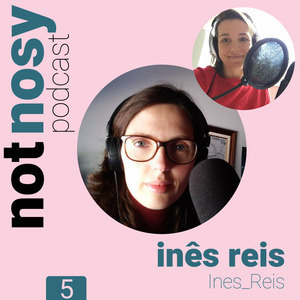 In this episode, Inês and Rebecca talk about being a first generation college graduate, changing careers, speaking and writing in a foreign language, and how (and if) the changing comedy landscape in the USA has affected Portugal. Inês was very supportive of Rebecca when she was starting out at HitRecord. She is very kind, self-described as shy, a fantastic writer, and has a surprisingly dark sense of humor. It's interesting to get a glimpse into another part of the world, and always interesting to have a conversation with such a talented artist such as Inês Reis. Sarah Webster (@sarabellab) is an actor and writer based in the Tri-State area. 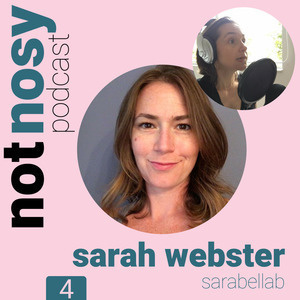 In this episode, Sarah tells us about how she got started into acting in North Carolina, her move to New York City, and the trials and tribulations of getting started in the business. Sarah and Rebecca also talk about being stay-at-home moms while also trying to remain actively creative. As always, there are plenty of fun anecdotes throughout the conversation - from trains to Tony Danza, albino ferrets to All My Children. Jonathan Cooke is a voice actor based in Los Angeles, California. 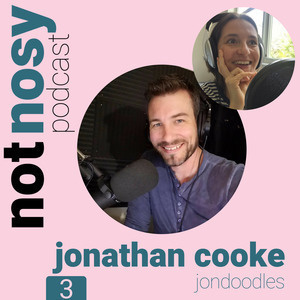 He is the first guest of Not Nosy that Rebecca has actually met in real life, but they originally met on HitRecord.org as @jondoodles and @recgator. Jonathan has an amazing natural speaking voice, in addition to a variety of character voices and accents. The two talk about everything from the details of voice acting from home and making decisions on accents, to Glamour Shots and u-pick auto parts. Jonathan is the voice of many video game characters, and also enjoys working on audiobook dramas, in addition to his commercial work. He's recently been featured in My Time at Portia and 39 Days to Mars, both PC games soon to be released for consoles. He also recently illustrated the children's book, Reggie Rabbit Learns to Hop by Naomi Voorhees. Tia Levings (@TSLevings) is a writer based in Jacksonville, Florida, currently with several exciting projects in the pipeline. In this episode, Tia and Rebecca discuss everything from motherhood to fictionalizing memoirs. This was a great conversation with surprising twists and turns...we hope you enjoy the unexpected journey! The conversation starts off with birth stories, which provide an important look into Tia's backstory, before turning to talk more about her second love, writing, including topics such as pulp writing, deep work and writing coaches. Tia is an old soul and extremely thoughtful in her approach to everything. They finish up the conversation with some talk about HitRecord, where they have worked on some comedy projects together, and a story about a kitchen sink. Rebecca and Tia realize they have more in common than they even knew. 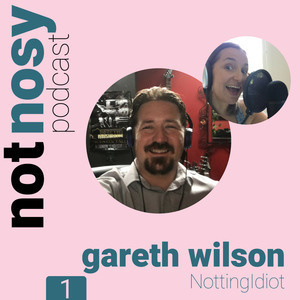 Gareth Wilson (@NottingIdiot) is a Resident Curator on HitRecord, specializing mostly in comedy. He talks with Rebecca about his past as a rocker, his journey to becoming a stand-up comedian and his passion for screenwriting. They reminisce about their early days working together on HitRecord, inspired by the world of Glenn Konkler, a short mockumentary created by Wunderboy about the man who invented the percussion loops for the Casio keyboards. But it's not all about HitRecord. Gareth is filled with random stories from bad breath to smoking (no, they're not related) and gives us a tutorial in Rock and Roll. And as always, he keeps Rebecca laughing throughout. Hi there! 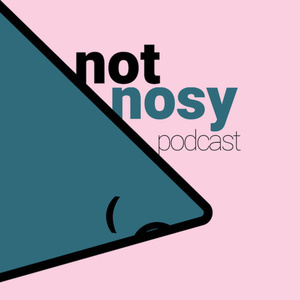 I’m Rebecca Carter (you may know me as recgator online) and I’m so excited to kick off my new podcast, Not Nosy. Over the past couple of years I have come to know so many amazing artists, from actors and writers, to illustrators, photographers and musicians. I mean just so many amazing people from all around the world. And I see their work and I get to know them a little bit and it just leaves me with more questions. I assure you, I’m Not Nosy…just curious! But I do want to know how do they know how to do what they do? What’s their backstory? Where do they want to go? And I just love to hear people’s personal stories about their life experiences. You may or may not already be familiar with the guests on this podcast. These are artists of all kinds who are in different stages of their career – some are professionals in their craft, some are hobbyists, some are working day jobs while they wish they could be doing their art full time. Regardless, I believe everyone has a lot to offer. I’m so excited to share these conversations with you. Each episode is completely unique and each guest is sharing great stories from their life. Can't wait to get started!